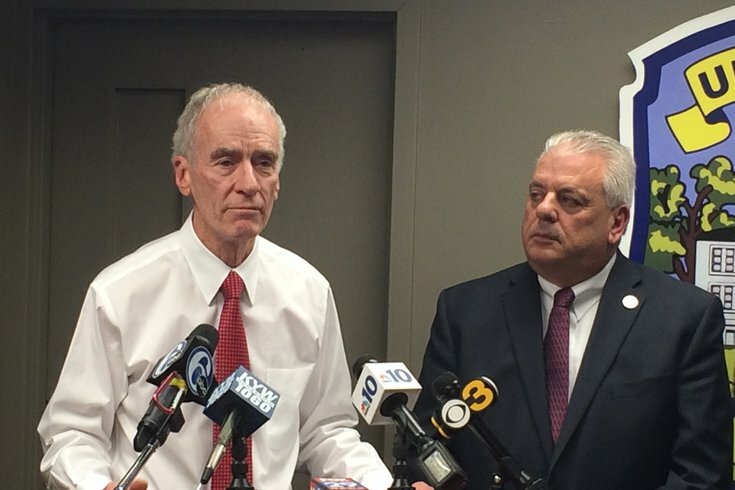 Upper Darby Police Superintendent Mike Chitwood, left, and Mayor Thomas Micozzie announce 'Change is Possible,' a new program designed to connect individuals struggling with substance abuse to rehab facilities. Upper Darby's police superintendent wants school districts to have the option of arming select teachers in school who would be able to fight back if a shooter enters their school and opens fire. Michael Chitwood touted the idea in a 6ABC report on Monday night, nearly a week after 19-year-old Nikolas Cruz allegedly killed 14 students and three faculty members with an AR-15 semiautomatic rifle in Marjory Stoneman Douglas High School in Parkland, Fla. on Feb. 14. Chitwood envisions a voluntary program that would allow pre-selected teachers or other school personnel to carry concealed guns in school in order to fire back at an active shooter. Pennsylvania law bars anyone from carrying guns in school or on school grounds. The "Save our Children" initiative, as Chitwood calls it, would therefore require the state government to make an exception for teachers pre-selected by a school superintendent or the school board. "We've got to do something and it's time to think out of the box," Chitwood told 6ABC. "What I would like to do is voluntary programs, have either the superintendent or the school board select teachers who want to go through the concealed weapons permit process." He told the station that he hoped getting the idea out to the public will stir "discussions and meaningful conversation," according to the report. "Everything we're doing right now, if you look, is not working," he told the station. "So let's go one step further. "People will be against it. I got it. I understand it. The bottom line is, we need to save our children." Chitwood was not immediately available to discuss the concept at greater length with PhillyVoice on Tuesday afternoon. Although gun control advocates and some surviving students and teachers have called for tougher gun laws in the wake of the attack – particularly tighter restrictions or bans on AR-15 civilian sales and improvements to the federal background check system for gun purchases – the debate on whether to allow guns in schools for self-defense has heated up, too. Colorado's House minority leader introduced a state bill this week that would allow people with a concealed carry permit to bring guns into K-12 schools there. Rep. Patrick Neville, who has offered the proposal every year since his election in 2014, was a student at Columbine High School when Dylan Klebold and Eric Harris infamously gunned 12 students and one teacher in 1999. Similar legislation is also reportedly being considered in Kentucky. The conversation also found its way to Harrisburg last year. Last summer, the Pennsylvania Senate passed a bill that allows a school board to permit licensed and trained "school personnel" access to firearms in school buildings or on school grounds. The bill does not define school personnel and does not specifically say whether school boards would be allowed to permit teachers to carry firearms on campus. The legislation, introduced last April by Republican Sen. Don White, passed on a 28-22 vote but has stalled in a House committee. Even if it passes in the House, Gov. Tom Wolf has said he will veto it. "School personnel shouldn’t be told that the only help they will get from Harrisburg to make schools safer is the option to carry a loaded gun around their students," Wolf's office said in a statement in April. Instead, Wolf's office said Harrisburg could give schools adequate funding to hire trained security like school resource or police officers.